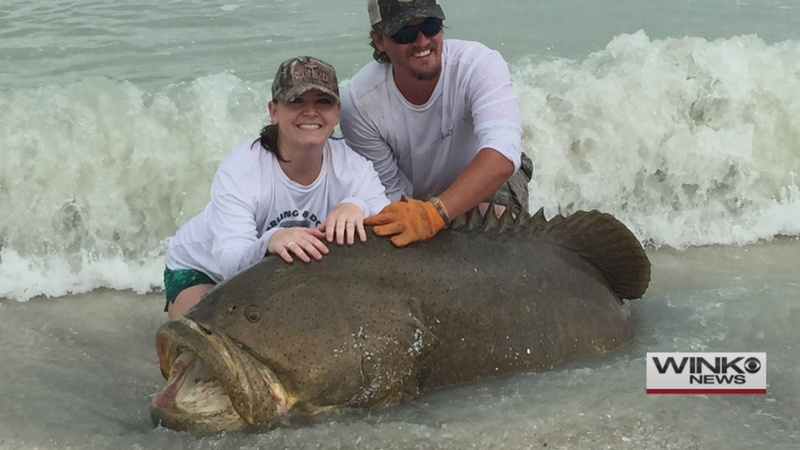 SANIBEL, Fla.- A couple fishing at the beach got a huge surprise when they reeled in a 300 pound goliath grouper. “I have never seen a fish that big and I fish a lot, and I have caught some big fish,” said Taylor Buckely. “It was just a spectacle,” he said. Early Wednesday, Buckely was relaxing on Sanibel and noticed a couple fishing with a large fishing rod. “But then I could see the rod tip moving, so there was a fish on it,” said Buckley. Graciela Mahana shot the whole thing on her cell phone. “For me it was very, very crazy because she was fighting with it,” said Mahana. Mahana says the woman fought the goliath grouper for about an hour. “You could see a dorsal fin and then a tail would come out,” said Buckley. Finally they were able to get the fish out of the water. “You would never expect that in a surf situation. You don’t catch fish like that by casting in to the surf,” said Buckley. The couple took a couple photos with the big catch and then released the fish back into the water.